After gaining size, Chinese plastics and rubber machinery manufacturers now strive towards world-class technology and look for growth abroad - Results of our new multi-client study. 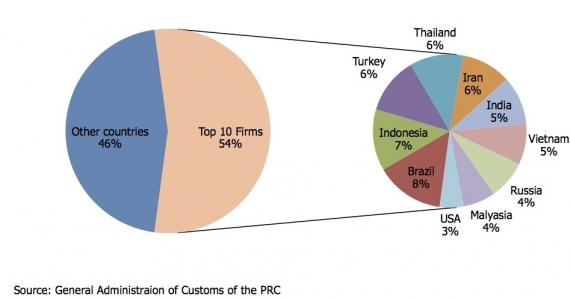 The PRC is the largest production base and market for plastics and rubber machinery in the world. Like in other segments of the mechanical engineering industry, we saw a dramatic shift of the global center of gravity from the West to the East during the past five to ten years. China has doubled its share in the world production of plastics and rubber machinery between 2007 and 2011, while the share of all other major producers decreased. The largest plastic injection molding machine manufacturer in China, Ningbo Haitian, is now also the world's largest manufacturer in this field. 14 of today’s global top 30 rubber machinery companies are Chinese. The majority of the Chinese production of plastic and rubber machinery is cheap and simple machines. They are mainly exported to emerging countries, where customer needs are similar to those in the Chinese market. Among the ten most important export destinations for plastics machinery from China was only one industrialized nation in 2011. In contrast to that, almost two-thirds of plastic machine imports come from Germany and Japan - countries that are traditionally strong in manufacturing high quality machinery. The total value of imports rose in recent years, despite declining numbers - an indication that the value of imported machinery increased. In general there is a large discrepancy between the average price of exported and imported machinery: imported injection molding machines cost on average three and a half times, extruders and granulators even 30 times as much as exported Chinese machines from the same category. The most important group of machines in the field of plastics machinery are injection molding machines. This type of machinery was responsible for 50 percent of domestic production in 2011, followed by extruders (including granulators and blow-molding machines) with 38.7 percent. The rest were other types of machines (thermoforming, etc.). According to the China Plastics Machinery Industry Association (CPMIA), there were 546 domestic manufacturers of plastics machinery in 2011, of which we identified and analyzed the most promising ones (77 domestic plus 18 international companies). Like many segments of the Chinese mechanical engineering industry, the plastic machinery industry is still very fragmented – the largest 10 companies account for only 39 percent of sales in the entire industry. Undisputed leader in the field of injection molding machines is Ningbo Haitian. Furthermore, there is a group of 16 specialized Chinese companies with sales from 100 to 500 mn RMB. Compared to the large number of smaller companies, they have international expertise, superior technology and easier access to capital. Therefore, we expect an increasing consolidation in the foreseeable future – not only in this area, but in the whole Chinese plastics and rubber machinery industry. The segment of extruders and blow molding machines is smaller than that of plastic injection molding machines. In the field of twin-screw extruders, pipe production and multilayer extrusion lines, Chinese manufacturers seem to have caught up with the international level. Companies like USEON announced that they were competing with well-known German manufacturers like Coperion or Leistriz. In the field of rubber machinery, we analyzed 14 domestic companies, which are responsible for about 50 percent of the total sales in the industry (210 companies, plus 11 foreign manufacturers). Main product groups are tire building machines, rubber mixing and extrusion machines (including calendars) and vulcanizing machines. While manufacturers of tire building machines in the lower market segment had severe problems since the crisis in 2009, leading companies such as MESNAC (No. 2 in this segment worldwide) or Dalian Plastics and Rubber Machinery continued to grow strongly. In the segment of mixers, Yiyang has acquired the patents for the mixer technology from German Krupp and competes with US-based Farrel for the worldwide leading position in this segment. The market for vulcanizing machines is very concentrated: Two state-owned companies share 80 percent of the domestic market in this field. During the 11th Five-Year Plan period, the Chinese plastics machinery industry did not only double its production volume, but partly also achieved significant qualitative progress. In 2007, Ningbo Haitian introduced three all-new model series of injection molding machines, which are able to serve 80 percent of all applications in this area – at very competitive prices. The machines were not only a great success in China, but also internationally: sales of the company in the U.S. grew by 500 percent from 2006 to 2011, for example. 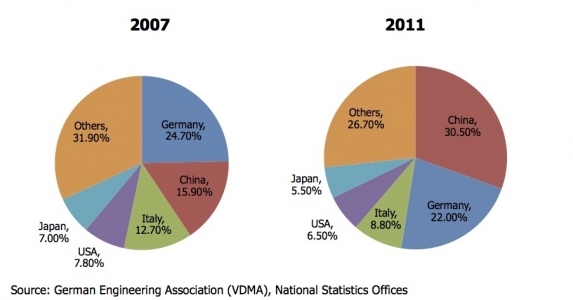 3 Chinese plastics machinery manufacturers have taken over companies in Europe and North America. And the number of acquisitions will continue to rise: A Chinese company has been the long-time favorite among the bidders for Krauss Maffei in late summer 2012. In the field of rubber machinery, Mesnac has two development centers in Europe and has acquired the U.S. company WYKO recently. Dalian Plastics and Rubber has an R&D center in Canada and acquired a company in the Czech Republic. Compared with other industries, there is already a relatively large number of plastics machine manufacturers listed on the stock market, some more have announced to prepare for an IPO. Despite this remarkable success, the Chinese plastics and rubber machinery industry is facing some major challenges, which are characteristic for the whole Chinese mechanical engineering industry: The majority of companies produce simple and cheap machines. The development of higher-quality machines advances only slowly – a serious problem, since the major growth will be in the mid-to high-quality segment during the coming years. The innovative power of most companies is low. The reasons for this are a lack of qualified human resources, short-term thinking on management and staff level as well as a lack of intellectual property rights that inhibits the willingness to invest in research and development. Other problems include a low level of automation in production and a weak branding of domestic manufacturers. Furthermore, there is still a heavy reliance on foreign components in the areas of control systems, hydraulic pumps, valves and motors. The coming years will be crucial for the further development of China: Either it succeeds in reforming its educational, political, and legal system, changes certain cultural practices and becomes a powerful high-tech location, or it will become stuck in the Middle Income Trap. future of the country as a high-tech manufacturing location, mechanical engineering in general enjoys a high priority for the government in Beijing. Besides a number of general plans and documents for the entire industry, the government in Beijing explicitly mentioned the plastics machinery industry as eligible for governmental support and defined some development goals during the past three years. These goals concern primarily the development of larger, more energy-efficient and precise machines as well as machines for the processing of new composite materials. The CPMIA expects an average annual growth of 12 percent until 2016, and in fact the consumption of plastics in China compared with western countries is still very low. In the mid-to high-quality segment, these assumptions seem plausible to us. Further capacity expansion in the sectors automotive, medical, energy and environmental technologies, as well as the development of new industries like aircraft and railway construction will provide for a growing demand for high-end machines. Chinese manufacturers of plastics machinery are eager to serve this segment by themselves and do not want to leave it to foreign companies any more. Ten of the companies that we interviewed are currently modernizing and expanding their production facilities. They have ambitious growth targets – not only at home, but also on the world market. For simple machines we only expect a modest growth, not least because of the faltering light industry. The Chinese Rubber Machinery Association expects an average growth rate of 10-20 percent per year until 2016. Another goal is to increase the global market share of Chinese producers from 33.5 to 50 percent by the year 2016. The machine manufacturers are looking more skeptical into the future, though: At present, only two expansion projects have been announced, and these are primarily for the production of new types of machines.